Listen to Your Instincts: You’ve heard the old expression, “Go with your gut” time and time again. While it’s not a foolproof method for decision making, you should work on understanding and interpreting your own emotions. After all, your instincts almost always lead to decisions closely aligned with your values and beliefs. Listen to Your Team: Do you truly believe the old leadership truism that says, “All of us are better than one of us?” If so, you should take the time to hear from your team members on a regular basis. Limit distractions during this time and focus on what they have to say. By seeking your team’s input, you will boost motivation and ultimately make a positive impact on the company. Listen to Your Customers: Proactive leaders listen to the needs, desires, and complaints of their customers. This feedback - whether positive or negative - is valuable and can help you make decisions based on true results. Letting customers know they’ve been heard increases loyalty and contributes directly to the enduring success of your business. Listen to Your Peers: Taking time out of your schedule to communicate with other leaders and CEOs has proven to foster business success. Build connections with those facing the same issues and goals as you. You might be surprised by the perspective and wisdom that can be imparted, even from leaders in completely different industries. Listen to the Numbers: Be intentional to examine the numbers on a regular basis. Paying close attention helps you decide where to focus your energy and how to better utilize your resources. The old saying, “The numbers never lie” is a good reminder for any leader. Listen to Your Vision: It is every leader’s job to cast the vision and set the direction for the company. However, as you communicate this direction to others, it is equally important for you to hear the message. Listen to your vision, and you will be more effective in motivating your team. Listen to Your Body: Long days, multiple projects, and conflict resolution can certainly take their toll on a leader. Your role, while generally energizing, can sometimes become exhausting. Listen to what your body is telling you and respond by resting when necessary. This investment in your personal health will maximize your leadership abilities. Listen to a Mentor: As a leader, you are always serving as a mentor to others, but having a mentor of your own can be extremely valuable. Seek advice from others who have been where you want to go. A mentor can provide valuable guidance, helping you stay on track and encouraging you to reach your destination. Listen to Your Values: You know the core values that define your role as a leader. Stay true to those values and remind yourself of them daily. When a leader goes against his or her core values in decision making, it almost always leads to regret. Listen to Your Family: Ask any business leader about finding balance between work and home, and they’ll likely say it is a tough art to master. Neglecting your family for the sake of keeping a project moving at work is never a wise idea. Listening to those closest to you will actually improve your management skills and help you find a balance that is healthy for everyone in your life. Making investments in your personal communication skills translates directly to an investment in your business. Becoming a better listener can benefit your team, your family, and your customers in a big way. However, it is difficult to accomplish goals without strategy and support. 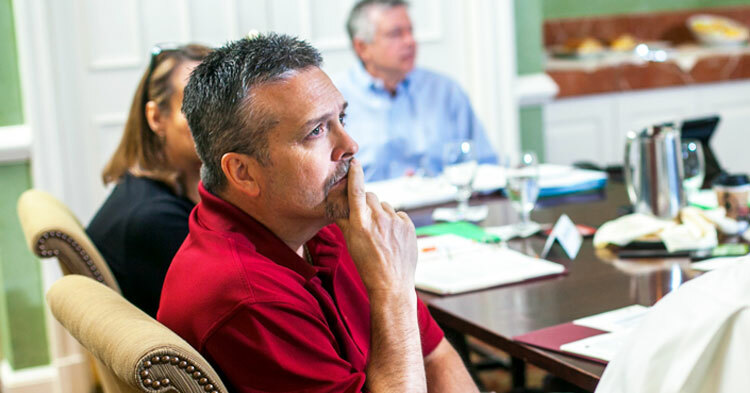 C12 Group is America’s leading CEO roundtable, providing MBA-level education, executive coaching, and sound business advice based on Biblical principles. Find a group near you and get plugged in today.